"The owners, Made and Khade were extremely friendly and helpf..."
Have a question for Satya House Ubud? "A lovely home stay in walking distance of the market and palace." "Breakfasts here are simple and may not suffice for those who enjoy a hearty start to the day." "We had such a wonderful time here that we ended up staying here for 2 weeks and would definitely stay again if ever in Ubud." "The staff was always friendly and tuned into what we were th..."
Ideal for fun and relaxation, Satya House Ubud is located in the Ubud area of Bali. Only 29 km away, this 2-star hotel can be easily accessed from the airport. With its convenient location, the hotel offers easy access to the city's must-see destinations. At Satya House Ubud, the excellent service and superior facilities make for an unforgettable stay. This hotel offers numerous on-site facilities to satisfy even the most discerning guest. The hotel features 6 beautifully appointed guest rooms, many of which include dressing room, linens, mirror, towels, internet access – wireless. Besides, the hotel's host of recreational offerings ensures you have plenty to do during your stay. 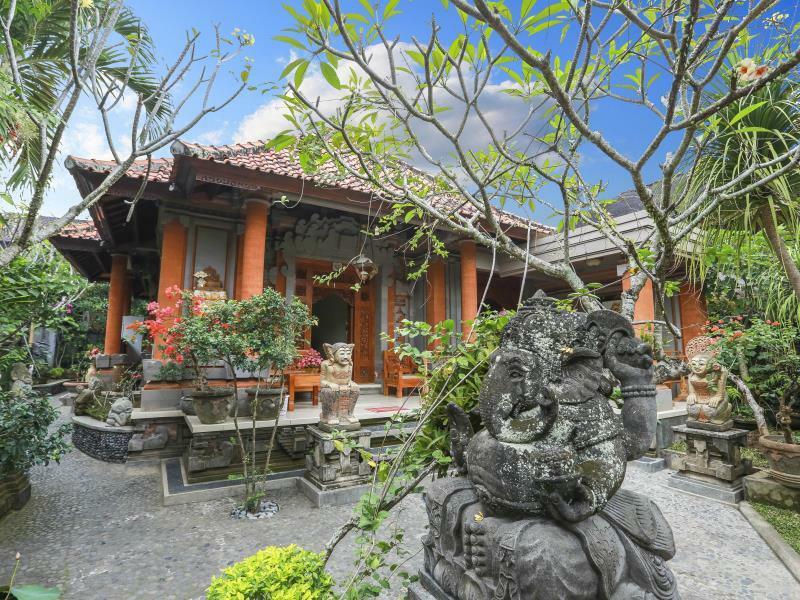 Whatever your reason for visiting Bali, the Satya House Ubud is the perfect venue for an exhilarating and exciting break away. "I really enjoyed staying here as my room was big with a nice..."
Air Conditioning facility is not offered when booking at Superior Double or Twin with Fan room type. I really enjoyed staying here as my room was big with a nice king-sized bed and good a/c. My 2nd floor room had a small balcony with a tablewhich was good for working on my laptop. The staff are very friendly and nice. So far, fantastic central Location still quiet and a bit tugged away. Beautiful homestay, nice spacious room & a lovely family who runs the place. Haven't used the pool yet but it looks clean :-). I've extended my stay twice now so the final review will follow. So far - everything is great, comfy bed, good aircon (payed extra) + clean..
We stayed here for 3 nights to be near centre of Ubud at a cheap price which is what we got. Breakfast was brought to our room every day and sat on balcony to eat this. We did feel confined to our room as there are no other facilities or social areas. Some areas building work was happening. Apart from the dog barking and chickens, we had a good sleep. Central location, cleanliness could be improved. My flight was cancelled because of the volcano so I couldn’t make it. My friend was already there and asked to cancel the night/postpone for the next day. They said there was no reservation under my name and that the guesthouse was already full anyway. No refund, never saw the room. A lovely home stay in walking distance of the market and palace. Lovely driver (Yoga) who not only took us to various sites for a day but also drove us to western Bali to our next accommodation for a very reasonable price. Breakfasts here are simple and may not suffice for those who enjoy a hearty start to the day. Plenty of restaurants in the area so some may prefer to forgo the breakfast offered for additional fee. There was construction going on at the time of our stay, so the view from our comfortable front sitting area wasn’t so beautiful as it will be when the pond is finished. But work was generally quiet (although continuous throughout the day, even on Sunday). I can’t compare to other home stays, of Which there are many, but certainly a fine place to stay in Ubud. Great location, very clean rooms, staff super friendly, also comes with breakfast delivered to your door. The family who runs it is lovely. I would highly recommend this place! Great value for money! Thank you for such warm Hospitality! I love Satya House! We had a nice stay while travelling through Ubud. The young guy who was working there was super friendly and helpful, by organizing our scooter rental as well as getting us a taxi when departing. Would stay here again! Stayed for 4 nights, the attendant just asked me on the first day what time id like my breakfast to be served and he served it consistently 8AM during my stay there.. Good job! Not a fancy place but definitely worth your money. This was my second stay at Satya House. It is a good place to stay for longer period since it's budget friendly yet provided everything you need. Good location, clean room with private bath room, daily breakfast, private porch, daily cleaning, helpful staff and owner. You might trouble a little to find this place, but actually this guest house exactly located accross the Atman Cafe II, carefully read the board sign, just a few steps aways from KAFE, and 5 mins walk to Yoga Barn. I love staying at Satya because all my favorite spots in Ubud are easily reached by foot. If you are tired with over rated pricey food at Ubud's happening restaurants just walk a bit from Satya towards jl Raya Ubud, on your left you will find humble Balinese Warung Sapta. It provides simple Balinese buffet with various options, from cut fruits, chicken rice, tuna wrap, vegetables and more. Breakfast was simply however sometimes that is much better than many options to choose. We loved the old fashion feeling of this accommodations and would definitely highly recommend this to our family and friends. Only pre-booked one night , stayed for a week . Easy communication with hosts . Hidden location off Hanamor in the heart of town . Highly recommend . Came in to check in at 7pm. Lights were off and no one was home. Left and came back an hour laster and same thing. As a traveller I didn’t have access to a phone and no option for email contact. Wasted $30 as I had to stay in a hostel down the street instead. Perfect! Super kind staff, nice garden, good location, clean, comfortable beds. Loved my stay at Satya House for a number of reasons and would recommend to both solo travelers and groups. Great central location, charming atmosphere, very clean, friendly staff and great value for money. Especially loved that there was variety every morning when it came to the complimentary breakfast. Highly recommend! An absolute gem which we were not expecting for the price. Would highly recommend. Great location in the centre of everything, but extremely quiet as set a little back from the main road. Great little breakfast, and the staff were really helpful.